I officially have the “winter blues”! It has been unbelievably cold so far this winter, making it hard to even enjoy a winter run. I have multiple “projects” around the house to do, but I really need an out door activity to get me outside! Sure, I keep the birds fed, the driveway shoveled, and take the snowboard out here and there, but man would I like to see some green. So I started looking into winter seed sowing again. I tried this last year and it didn’t go very well at all. I think I started them outside a little early, so this year I’m going to take my time researching out seeds, soil, germination, etc… I’ve been doing a lot of research again, and I’ve put down some of the most popular tips & tricks I’ve found below. If any of my amazing readers have any additional tips please feel free to comment below. Pay close attention to the seeds needs as you select. Most seed packets have information regarding the seed’s germination requirements. Seed catalogs have started to arrive to my mailbox, but there are also many online options for ordering as well. One online source I’m going to use is DollarSeed, mostly because they are local to my area their twitter handle is @DollarSeed if you’d like to check them out there. Again there are multiple sites and catalogs that should provide you with all of the information needed to select your seeds, and if you can’t find one you can always Google it. Now that you’ve selected your seeds it’s time to sow. I’ve decided to use the re-use, recycle method of using old plastic containers. Whether it’s a plastic milk jug, or old Chinese delivery container, it’ll be perfect for winter sowing. The steps are simple, and should really take no time at all. As I said use gallon milk jugs or similar containers like, food trays with clear lids or old Chinese delivery containers (I have a lot of these). If using jugs, cut open horizontally around jug but leave hinged just under handle. Punch several holes in bottom for drainage, and several holes around neck or in the top for to let air in and allow evaporation. Also punch 2 holes in the sides of the container. Fill with 3-6″ of regular potting soil, not soilless mixture. Moisten the soil or bottom water to start. Plant the seeds you’ve selected as required by their size, etc… And Be sure to label them, I always forget to label and end up playing a guessing game!! Tape the jug around the cut, and place on patio next to house. I have a screened in porch that I’m going to use. 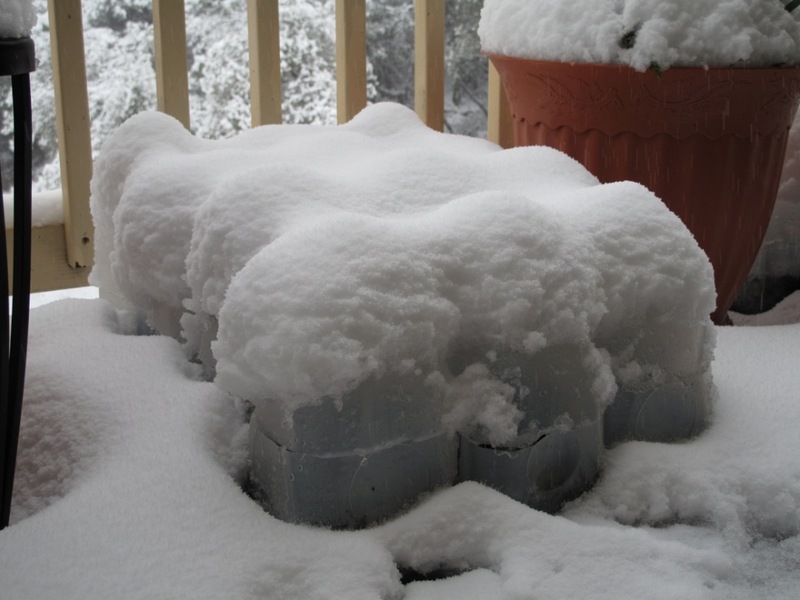 I might be able to use some less hardy seeds as it stays relatively warm. Check occasionally for condensation and water when sunny & the need is there. Put extra holes in container in the spring to get rid of extra moisture or you may want to open the top all together. When the frosts have passed, separate your seedlings into clumps or individual plants and plant in garden. And there you have it! I’m looking forward to trying this again, and hopefully I’ll have some good news to write about in the spring. I’m going to have my little ones help since they are already starting to go stir crazy too! This entry was posted in Birds, DIY, Gardening Tips, Homeowner, Indoor Gardening, Landscaping and tagged Facebook, fertalizer, Garden hose, Google, Login, sow, sow seed in winter, sow seeds, spring, spring blooms, the perfect garden hose, Twitter, Winter, winter sowing. Bookmark the permalink.